Deodorant brand Lynx and the Australian Red Cross are the most unlikely of bedfellows, however, they appear to be a well suited match as part of Lynx’s global ‘Make Love Not War’ campaign. 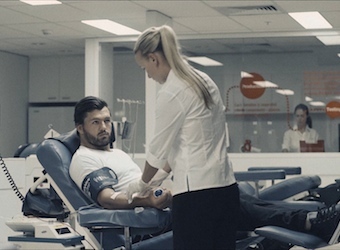 The campaign first aired during the Super Bowl, with the Australian arm of the initiative has asked Australian guys to make the ultimate demonstration of love: a blood donation in the name of peace as part of the partnership with the Australian Red Cross Blood Service. Called ‘Love Is In Your Blood’, the activation promotes the new Lynx Peace range and aims to get 85,000 Australians to pledge to donate their blood to help save 100,000 lives – enough to fill the MCG. The activation is a collaboration between communications agencies Soap Creative, Mindshare and Adhesive PR. The launch film features Wallabies player and Lynx Peace ambassador Adam Ashley-Cooper. Check it out below. The integrated campaign includes digital display, mobile, PR, social media and real world activation events. Artist Bobby Haiqalsyah has also designed a unique mural for the activation, which is being used for a street poster campaign and on special ‘peace sleeves’ that are being distributed via mobile blood banks.